Gill’s commissions over the years have been many – they range from the highest achievers in the equestrian sport to much loved family pets. Gill works in all sizes from small to monumental in scale. Gill has worked for many private clients – including members of The Royal Family – as well as working on a variety of corporate and architectural projects, including door furniture for Chloe boutique and sculpture for Emirates flight lounges. 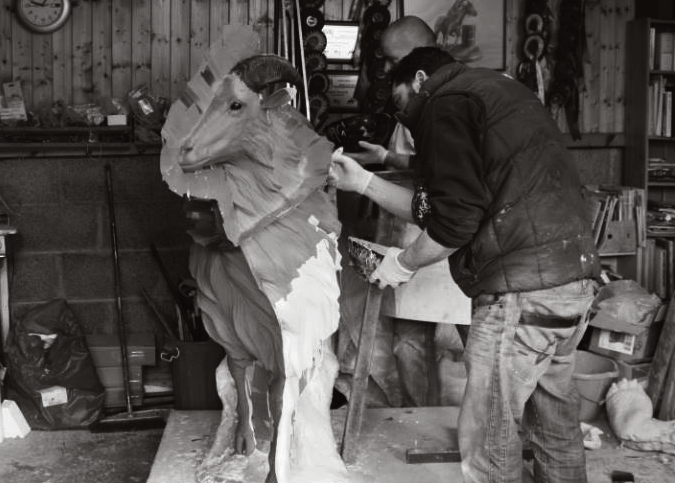 Other commissions include Badminton winners Sir Wattie and Middle Road; Derby winners Rainbow Quest, Dancing Brave, and the life sized Motivator at Ascot Racecourse as well as many dogs and other animals. Commissions are dealt with on an individual basis. If you would like to discuss a commission, or would just like some advice, please contact hesitate to contact Gill either by email at bronze@gillparker.co.uk or telephone +44 (0)7885 273 309. Commissioned for Emirates' flight lounges. "The materials I work in are wax, clay or most often plasticine. The sculpture is built up on a wire armature and worked on until I am happy with the result. The sculpture is then moulded in rubber; a two piece mould supported by a plaster or fibreglass ‘jacket’. The inside of the mould is a space or ‘negative’ impression of the original sculpture. By pouring molten wax into this mould, which is allowed to harden, a hollow wax impression of the original is made. At this stage the wax is usually checked and worked on by the artist. A system of ‘runners and risers’ is made around the wax sculpture. 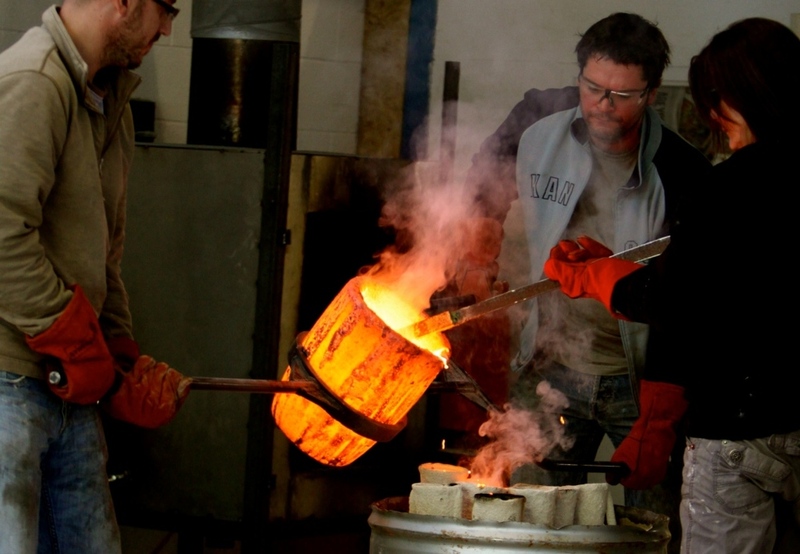 This, in the later stages of the process, will enable the molten bronze to flow quickly to all the parts of the sculpture and allow the air to escape. The whole wax ‘structure’ is now dipped in a runny ceramic material. As that dries the process is repeated again and again until you have something which looks like a lump of clay, the wax impression being inside. This ‘mould’ is baked, and the wax inside burns out (hence the name, the lost wax process) leaving a cavity where the sculpture was. It is into this that the molten bronze is poured. Once cool, the ceramic material around the bronze is broken away to expose the sculpture. The runners and risers are cut off and the surface of the metal is restored to the artist’s original work. The bronze is polished and if the original design requires it, tack (bits, reins etc.) are fabricated in bronze and added. Patination is the process of colouring the bronze. Bronze is a metal alloy containing copper, which reacts with certain chemicals. Different chemicals and dilutions of those chemicals are built up on the heated surface of the bronze, until the desired colour is obtained. Whilst the sculpture is still hot, a wax polish is applied and when cool, it is buffed up to show the wonderful finish. Without patination, a polished bronze looks the colour of a newly minted coin. This is a very brief explanation of a very complicated and skilled process, which hasn’t changed in essence, for thousands of years." "I consider the relationship with my casting team is paramont to the quality and integrity of the sculpture I produce. I enjoy working with a great bunch of people, most of which, I have known and worked with for many years and some, for my entire career. These are skilled people who know how I work and the quality I require." Motivator, Derby winner 2005 Life Size sculpture for Ascot racecourse. Cheveley Park Stud Sun Chariot Stakes, Newmarket. Tattershalls Polo Trophy, Saratoga , N.Y.
Loewe Trophy, Guards Polo Club, Windsor. Trafalgar House Supreme Novice Hurdle, Cheltenham. Bonus Print Stayers Hurdle, Cheltenham. Either gifted, purchased or commissioned. 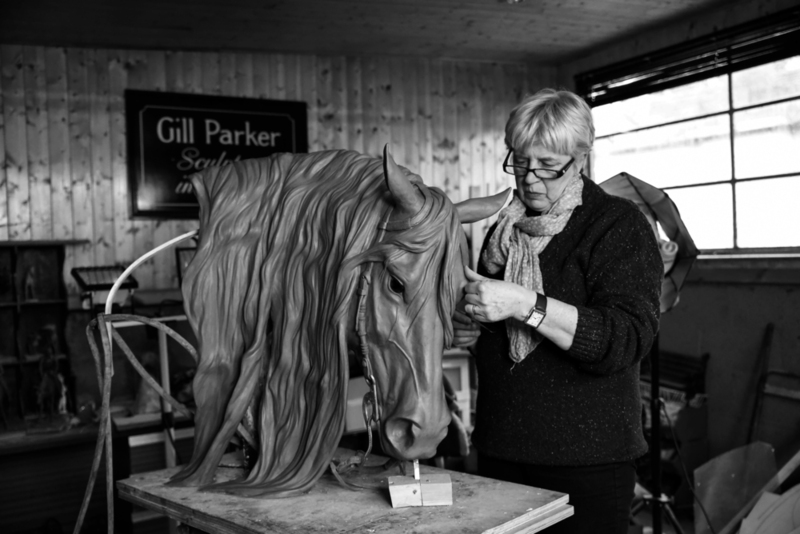 Gill is undoubtedly the most talented sculptors of her generation, that we have come across. She manages somehow not only to give her work a great sense of movement, but also make them wonderfully tactile.